Just finished Chris Voss’ Never Split the Difference. Chris was a 25-year veteran of the FBI’s hostage negotiation unit where he honed his skills in negotiation. In contrast to business school education of negotiation, Chris’ experience was cultivated in real-practice. Though his experience was incredibly serious (negotiations were over lives), he realized his ability to effectively negotiate in most every situation including business. 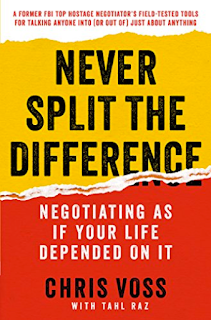 In contrast to teachings from other negotiation books like Getting to Yes, Chris realized that for him, there could not be a win-win situation. He could not “split the difference” with hostage takers – “I’ll take two hostages, you take the other two”. It was about life or death. The crux of Chris’ learning and the foundation of the book is being able to separate the emotional side of a person vs. the logical. In this way, Chris could leverage his preparation to shake up the other party, and cause the other party to reveal their intentions. This enabled Chris to influence the negotiation so the other party was moving towards Chris’ goals seemingly on his/ her own. Controlling emotions is critical. In negotiations, it’s easy to get personally and emotionally involved. However, this is where rationality can be lost. Exude confidence and calmness to influence the other party. Preparation is key. In every negotiation, it is best to be well informed on the goals of the negotiator, and what are the potential goals of the other. Prepare understanding the other person’s interests – be empathetic. Chris mentions how “black swans” can be important in influencing a negotiation – some outside insight that can change the game. Listen to context clues of the other’s intentions that can reveal clues as to the motivations. These can be financial trouble that is not known at the beginning, etc. Mirror – this isn’t just about mannerisms and behavior. Instead, Chris highlights the effect of repeating the 3 (or so) most important words someone says – in a calm tone with a slight upward inflection like forming a question. This buys the negotiator time to think about a response, but also gives the other party to reveal more data points. Analysts vs. accommodators vs. assertive. These are the three broad types of negotiators. Analysts need time to think about a situation. Rushing them will cause them to push back. Accommodators are collaborative but can also give up more interests to reach an agreement. Assertive negotiators ask less questions; instead, they choose to tell. For assertive negotiators, they need to be heard first before hearing the other. A few questions that help buy time, but also thrusts the onus on the other party to help come up with a resolution (thus, get buy-in later): “How am I supposed to do that?” “Your offer is very generous. I’m sorry that just doesn’t work for me”. Chris offers this one line as a means to get a response via email: “Have you given up on this project?” Many reasons for why/ how this works including its directness in causing the recipient to think about loss aversion. This can be a very incredibly uncomfortable email, and though I think it could work, it could work in a detrimental way without some edits. Label feelings with “It sounds like…”, “It seems like…” to get the other person to confirm and to speak more and reveal more information. “You’re right” vs. “That’s right”. There’s a difference when the other party responds one of these ways. “You’re right”, typically, is the response the other party is just trying to move on. They don’t actually agree. “That’s right”, however, signals an agreement in what the other says. “That’s right” signals the negotiator is on the right-track. Chris asks questions and labels feels to get the other party to suggest solutions, and then, repeats these solutions to get the buy-in from the other party. Use exactness and precision in negotiations to seem like it’s calculated with reason. For example, telling the other party you can only $477.65 seems too precise to be made up vs. $500. 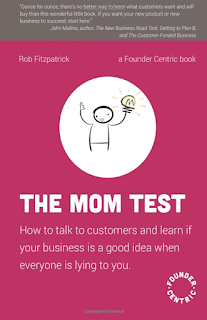 Let other party feel like they’re in control by asking a question looking for a “no” (i.e. is now a bad time to talk?” Let them feel comfortable and in control knowing they said no. Anchor emotions to the worst case at the beginning, then ask if there’s anything else. (For example, “you probably feel that I want to gouge you of all your money. You might even think that I just want to kick you out of the apartment to make more money from someone else. Am I missing something else?”) Let the other party consider the worst-case scenario before you pitch a not-as-bad scenario. Coupled with using specificity (not round numbers) in a negotiation, offer another concession that you don’t care much about – the “gift”. This has the perception that you really have nothing else to offer. Rule of 3 – the idea is to get the other party to agree to some statement or commitment three times. It’s hard for folks to lie 3 times. Use this to get past seemingly non-committal responses. 7-38-55… ratios of what is communicated. 7% is the words actually being said. 38% is the ton of voice. 55% is the body language including facial expressions. You get so much more by meeting in person – body language. There are some real good tips in here from Chris, and lots of good take-aways for a sales guy (anyone, since we’re all negotiating something sometime). In hostage negotiation, there are limited options/ alternatives. In sales and business, there are usually other alternatives (best alternative to a negotiating agreement (BATNA)). As such, there are situations where win-win situations is the only way deals can be made. Looking for the only win can be short-sighted. However, again, there are great take-aways here applicable in many situations. There’s a reason why selling solutions to pains works – there’s an emotional component to pain. Practice and know how to employ Chris’ teachings.